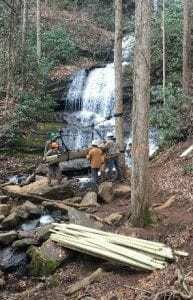 LUMPKIN COUNTY, Ga. — The U.S. Forest Service, Blue Ridge Ranger District of the Chattahoochee-Oconee National Forest, along with partners and volunteers, completed reconstruction of the DeSoto Falls Waterfall Observation Deck near Blood Mountain in Lumpkin County on March 18. Following Hurricane Irma damage to the observation deck, the Forest Service requested emergency funds from the Washington Office, and received funding in fiscal year 2018. The severely broken deck was removed in Spring of 2018, and the trail remained open without the observation deck. The reconstruction project started March 4, by the Forest Service in partnership with U.S. Army Rangers from Georgia’s Camp Merrill, Mountain High Hikers, Benton MacKaye Trail Association, Georgia Appalachian Trail Club, and other partners. Expert mountaineers from Camp Merrill used the opportunity as a training event to set up a rope suspension system to transport 8,000 pounds of lumber from the trailhead, across the creek, onto a transport, down a half mile of trail and across the creek again then up to the base of the waterfall. Nearly 20 volunteers worked together to move all the materials to the project site, and achieved a lot in a short amount of time. Battling cold weather and abundant rain, construction began later that week. The substructure was complete in three days, the deck was laid the next week, and handrails and structural bracing was finished March 18. DeSoto Falls is a very popular area for weekend Blue Ridge Ranger District forest visitors, and while there is still work to do on the trail, the recreation area provides a high quality opportunity to visit these waterfalls. DAWSONVILLE Ga. – The Dawson County Board of Commissioners voted unanimously Thursday (July 19) to participate in a class-action lawsuit against the federal government to recover money the county is due under the Payment in Lieu of Taxes (PILOT) program. The PILOT program allows the federal government to make payments to local governments in lieu of paying property taxes on federal lands within eligible counties. There is no cost to the county to join the lawsuit and the county could recover thousands of dollars owed to its taxpayers. “There is no downside to and there is a good possibility the county could obtain a modest amount by way of the class action,” County Attorney Lynn Frey said last week. 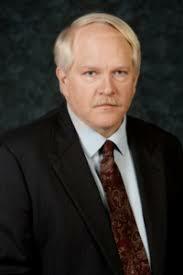 The federal government can still appeal the court’s decision, but Frey says he has seen no indication it will do so. Retaining the Athens-based law firm of Blasingame, Burch, Garrard and Ashley to represent the county in multi-district opioid litigation to recover expenses incurred by the county arising from the ongoing opioid crisis.